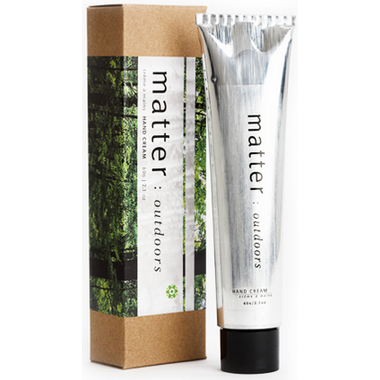 Matter Outdoors Hand Cream is an intensive moisturizing lotion for rough, overworked hands & nails. It soothes & restores moisture to dry, cracked skin. Product Usage: Use as needed; for gardners,rock climbers, & people who get their hands dirty. Ingredients: Aqua (water), olea europaea* (olive) fruit oil , cetyl alcohol, leuconostoc (radish root ferment filtrate), glycerin (vegtable), emulsifying wax, persea gratissima* (avocado) oil ,butyrospermum parkii* (shea butter), aloe barbadensis leaf extract, galium aparine* (cleavers) extract, equisetum arvense* (horsetail) extract, plantago major* (plantain) extract, symphytum officinale* (comfrey) extract, citrus bergamia (bergamot), citrus racemosa (grapefruit), pinus sylvestris (canadian pine) and thuja occidentalis (cedar) leaf essential oils. Why is this discontinued??? This hand cream is amazing! smells great, soaks in quickly and worked to keep my kids hands from being dry and cracked all winter. The skin on my hands tends to crack during winter and I've finally found a way to stop it in using this cream. It works wonders for me. The smell of bergamot and pine is also very soothing. Best service from Well.ca also, very satisfied customer. Great cream, not greasy, absorbs fast. It has a scent of pine when applying but it goes away quickly. Love this hand lotion! It absorbs quickly and has a lovely fresh subtle scent. My hands get extremely dry and cracked during the winter. I noticed an improvement after one application. Amazing product. It is the only cream that healed my dry hands and i don't even do gardening. The only thing i would love if they would change the cap to a snap off so you don't have to take it off ( helps when putting on cream while in the car )...other than that, love it, even the packaging is so simple nothing more needed. Scent is nice and it evaporates quite fast which is a winner for me since i don't like to walk around smelling like hand cream. Happy customer. Love this hand cream!! I tried it the first time at the One of a Kind show and loved it's so much. I was so excited when I saw it was sold here which makes it so much easier and cheaper to get. This cream is so naturally nourishing for my skin. I love the texture, how quickly it absorbs leaving my skin moisturized and not greasy. I will continue to buy again and again. We've used this cream for many years and although we have to get it via mail, it is still the best hand (and foot) cream ever. Mild scent is fresh but not flowery. Great moisturizer that does not leave a greasy residue. Very light and pleasant smell too. Great nurishing hand cream. The best non toxic cream I've found on the market. This is my favourite hand cream. Canadian made, smells great. Thicker formula but absorbs quickly and is not greasy. It has tken me a while to find a hand cream that works on my very dry hands and this is it. It is not just for gardeners! Canadian-made (!!) hand cream with pleasant, mild scent. Absorbs quickly. Very good for dry hands. Not as rich in texture as Dr. Watkins cream, but still very good. Good value. AMAZING lotion but it is a bit too expensive for me for how much product is in the tube. I run through this way too quickly. But for those of you who wouldn't mind splurging on the lotion, it heals and protects my hands against the Canadian cold better than any other hand lotion I have ever tried! Great lotion, bit pricey but you don't need a lot at a time, so it evens out. Great scent. Amazing hand cream. Absorbs very fast and has the best scent. Love it. I found this hand cream to be a bit pricey. Works very well though! Love this cream, this scent is so fresh and isn't greasy! I bought it originally at Balls Falls in October 2015, and I am thrilled to see I can purchase more here! My favourite hand cream! Smells great and absorbs quickly.